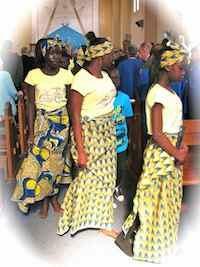 A Dinka-speaking Sudanese congregation meets on three Sunday afternoons of the month at 2pm in St Peter’s. On the first Sunday of the month, the various Sudanese communities and congregations of the Melbourne Diocese gather at one of their churches for a joint worship. Our Sudanese congregation has been here since 2004 and is led by the Reverend Joseph Arou. Through the work of Father Joseph and the entire parish we support the running of an Orphanage in Bor, South Sudan.